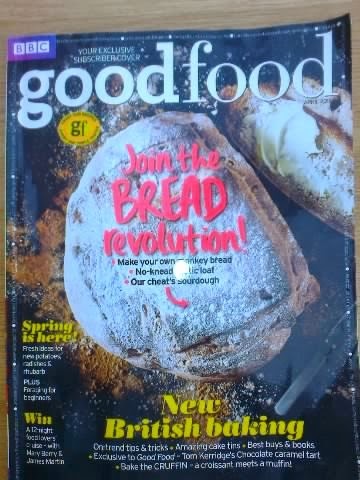 If you have a passion for baking then the April edition of Good Food magazine is just for you. 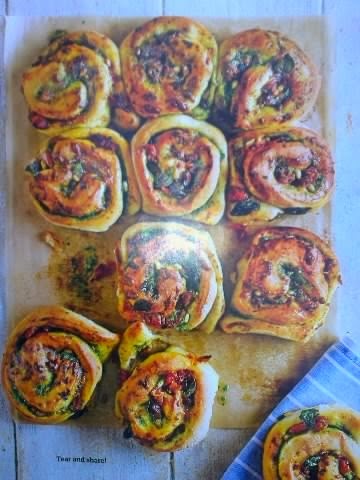 The 'bread revolution' as the magazine calls it, is underway this month with some fabulous bakes like Cheese and pesto whirls (below), Seeded wholemeal and Gluten-free chilli cornbread. Real Bread Week starts on 9 May and aims to get more folk baking their own bread. I will blog about this at a later date. In the meantime, Good Food has some great Beginners loaves if you are new to bread-making and there is a step-by-step page to help. Food writer, Rose Prince, has an inspiring article on how making their own bread reaped rewards for her family. I agreed with her views on the use of bread-makers. We had one for 24 hours before returning it to for a full refund. There is no pleasure in using a machine, it is what factories do! As for the rise of artisan bread in our supermarkets, Rose makes a good point that they are trying to play catch-up but they cannot mass-produce and be an 'artisan' - the new supermarket bread may appear handmade, but they still taste of the factory. My wife's bread stall at our church fete each year can bear witness to this, with her many hand-made loaves flying off the stall even before the official opening. The baking theme continues beyond page 21 with 'baking trends' and a look at clever cake baking kit and trashy toppings (their phrase not mine). There are lots of tips, recipes for muffins, doughnuts and monkey bread and recommended books and websites to stimulate the creative juices. Twenty five of the hottest trends and innovations are well covered with lots of useful information. As usual, I liked the 'snippets' of news, reviews and best buys. Foodie Night Markets get a slot, as does Toast, which gets a make-over. I see Nigel Slater has a new BBC TV show, 'Eating Together' - another cooking programme that visits every corner of the UK to discover classic British and ethnic dishes we cook at home. There can't be many 'corners' left that TV chefs haven't visited, in their quest to earn more cash! Likewise, James Martin seems to be struggling to keep his name in lights and he does himself no favours in Good Food this month with uninspiring ordinary dishes like Potted shrimps, Roast lamb and Banoffee cheesecake. As for telling us how to produce Warm spring vegetables and Layered thyme potatoes, there is little effort here from the TV chef - money-for-old-rope, it seems! 'In season' has a few inspirational dishes using radish, new potatoes and rhubarb. The Venison with rhubarb chutney looks mouthwateringly good, while I loved the look of the New Potato and rosemary focaccia. 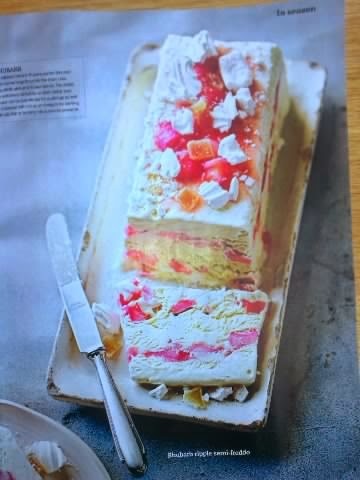 As for the Rhubarb ripple semi-freddo (above), I've already got the ice cream maker ready! Similarly, the feature on using wild leaves as a basis for a dish, provides some unusual recipes from forager Barney Desmazery. 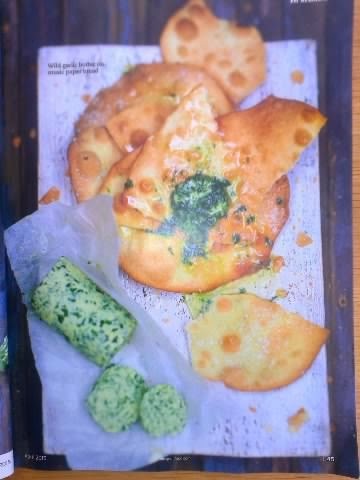 Wild garlic butter on music paper bread (below) and Nettle gnudi with wild pesto, are a challenge for any chef. Gnudi means naked and the dish is a nod of ravioli without the pasta. They are like light balls of ricotta gnocchi and sound as if they work well with blanched nettles. One for the future, I suggest! Gardeners get two pages devoted to growing tasty tomatoes, this month. Why would you want to grow anything that is not tasty, I ask? James Wong overturns traditional gardening advice to transform the flavour of home-grown fruit and veg. He suggests we ditch the grow bags and the greenhouse in favour of growing our tomatoes in the ground outside. Well, it does not convince me. Years of success with high quality grow bags in my glass house will not change my practice that easily. 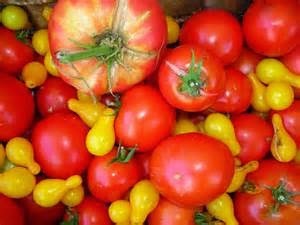 Nevertheless, James suggests some good varieties of plants segregated by 'best for sauces', 'cherry tomatoes', 'best for slicing' and 'best for salsa'. A few useful tips, but little for the beginner. 'Food Lovers Weekend' goes to Bristol, home of several food festivals. There are suggestions on restaurants, nights out and 'swim and eat' at Clifton Lido. The 'Weekend' feature covers Bank holiday brunch and 'Spring food for friends' . 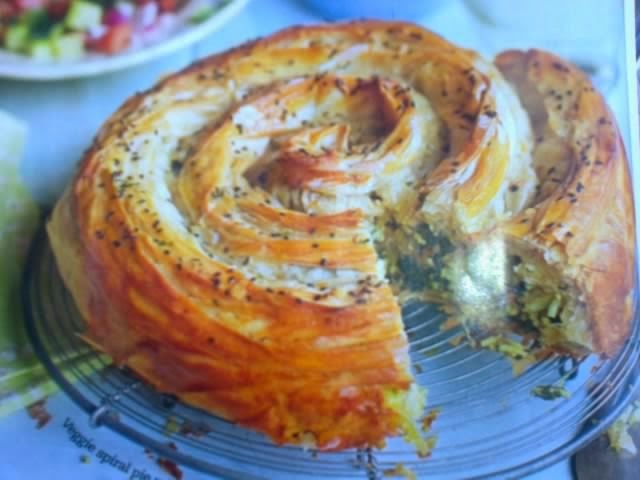 The Veggie spiral pie looks great (below), while the Coconut lime pie seems an inventive variation on my own Key lime pie, covered in an earlier blog. It certainly looks more appetizing than Tom Kerridge's Caramel chocolate tart. Meanwhile, over the page, Richard Burr, a finalist in last year's Great British Bake-Off, shows off his two daughters cooking skills. Why O Why do we always get kids to make pizza? Can't we inspire them beyond a dough base covered in tomato! Admittedly, the girls Cranberry and orange hot cross buns look okay, if a little hard, but Good Food have offered little in this article to get kids baking. Finally, this month's 'Cook School' does fresh yeast, knives and herbs with two pages on flour and which bags deserve space on our shelves. It's '00', 'Strong' and 'Granary' for me! 'My Kitchen' features Mark Hix, the chef and restaurateur and we get to see his Dorset kitchen which mixes rustic and modern. Rustic in the furnishings and modern in equipment. As an added bonus, we get his Sticky toffee pudding recipe for free, but if we want a cookery demonstration, it will cost £175 per person, including a welcome drink and a four course lunch. Did he agree to this article on condition Good Food Magazine promoted this money-making venture?